There are a lot of benefits that come with living in Florida. We are in the center of the sunshine state, where the weather is almost always warm and the sun shines over us 365 days a year. But with these temperate benefits come a few challenges. Damaged skin is the number one side effect of sun damage. Wrinkles, discoloration and in severe cases skin cancer can develop from overexposure to the sun’s rays. Anti-aging therapy programs help to reduce the effects of nature’s damage so that you can age healthily. When it comes to fighting wrinkles, there are steps you can take to prevent and in some cases minimize damage to your skin. What to do about Wrinkles? 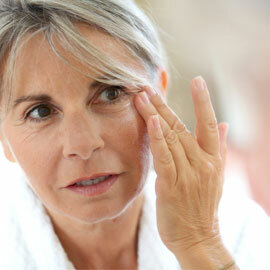 If you are worried about wrinkles, there are many things that you can do to help protect your skin. Reducing the amount of time spent in the sun is a great preventative step, as is wearing sunscreen and applying moisturizer. With all the brands available on the market today, how can you pick the right one for your skin? The bad news is that moisturizers alone don’t really help beyond plumping up the skin. The good news is that some ingredients in them have shown themselves to be good wrinkle “fighters”. Before you try any new cream or serum, it is important that you bring the item to your anti-aging doctor to ensure that the substance won’t cause any harm to your skin. Vitamin E is one of the ingredients you may want to look for in a skin cream. Studies have suggested that this vitamin can help decrease the depth and length of wrinkles as well as the roughness of the skin. If you are interested in trying a facial cream with vitamin E in it, be sure to check labels for one that has it listed as an ingredient. For best results, apply the moisturizer right after you wash your face or take a shower–but before you put on foundation or other makeup. This helps to lock in moisture against the skin. Moisturizers are an important part of any skin care regimen, and vitamin E is fast becoming one of the more popular ingredients in facial cream.